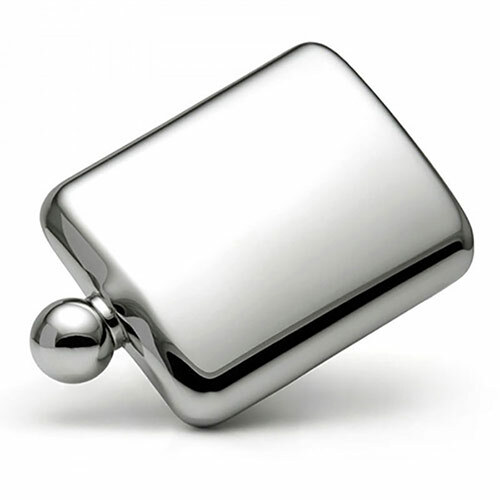 Modern hip flasks in stainless steel featuring a polished finish on a distinctive, gently rounded body and ball cap. These 6oz hipflasks are offered with FREE ENGRAVING of text and logos from Business Gifts Supplier. The body of these classic 'traveller' hip flasks features a gentle curve to sit comfortably on the hip or in a pocket. They are perfect for engraving as corporate gifts or logo engraved promotional merchandise, and with our free engraving offer you can customise these classic hipflasks with a company or brand logo, company name, marketing message, event details or any other inscription you choose.